Translate Psion 5 'Data' address book files into a format suitable for importing into Chris Morisons excellent !Organiser application. This program never really got developed more than a simple 'request for comments' feasibility study, mainly because I never received much in the way of feedback from interested users and also because Psion sadly ceased production of their excellent little PDAs. Users of PsiOrg may be interested in my ArcLink5 software for transferring files to and from EPOC-based devices, such as the Psion 5 and NetBook. 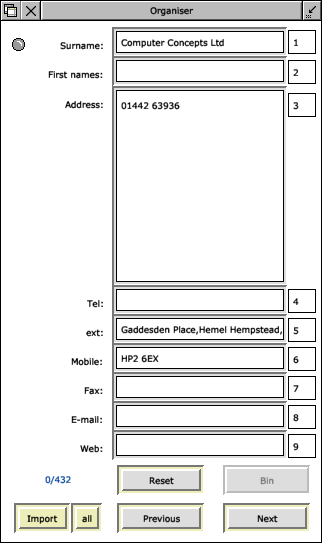 Screenshot showing incorrect Psion data imported into an Organizer style layout template. Simply drag and drop field 5 into field 3 in order to swap the 'ext.' and 'address' fields around, thus correcting the incorrectly positioned data. You can then import either a single record, or convert the entire data file using the current field mapping.